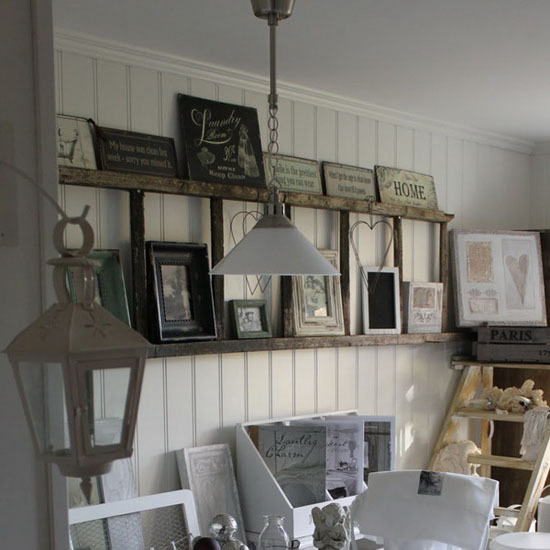 Attractive modern wall decoration can be created with useless and old items that clutter homes. Simple wall decorating ideas that recycle old ladders are creative, quick and easy. Old metal, plastic and wooden ladders are wonderful objects for making unique furniture pieces, free standing and wall shelves, unusual chandeliers, mini gardens with blooming indoor plants or edible herbs and modern wall decor that create unique home interiors. Old ladders, that you do not need, create clutter and take valuable storage space. Incorporated into modern wall decor, recycled old ladders add attractive storage space, creating small wall shelves and interesting displays of collectibles or small indoor plants on empty walls. Painted or not, old ladders is a creative way to add color, unique texture and shape to interior decorating or home staging. Old wooden ladders are excellent for bringing neutral grayish-brown colors and vintage style charm into interior decorating and creating personal and modern wall decor with beautiful collections pf paintings and phptographs, quilts, towels, books, vases and small indoor plants. Practical and functional, simple and cheap wall decoration ideas that include old ladders are the way of creating interesting and functional home interior decorating. Storage racks and wall shelves, made of old ladders, create additional storage space and help design very decorative displays with paintings, photographs, quilts, books, vases and small indoor plants or collectibles that brighten up interior decorating ideas and add a splash of color to room decor. Old ladders make convenient wall shelves for small indoor plants, creating stunning mini garden designs for healthier home environment and adding relaxing green color to wall decoration ideas. One large clutter item, like an old wooden ladder, door, window or mirror frame, can elegantly decorate an empty wall, adding personality, wonderful rustic wood tecture, neutral grayish-brown colors and charming accents to modern wall decoration in country cottage style. Find clutter items, like a broken chair, an old ladder, or a wooden box, paint them bright colors that match your home interior decorating color scheme, and use for creating shelves, furniture, room decor accessories and eye catching empty wall decoration ideas.